Tonight my parents took me out to That’s Amore, an Italian restaurant on Harbour Island where a singer they used to follow at the Jazz club “The Fox” was spotted by a friend singing. Being the food critic guy that I am, I started researching the place before I got there and found many negative reviews around Urbanspoon and Yelp. We cautiously headed to the restaurant unsure of what to think about it. When we got there we were greeted with a pretty spectacular view of Downtown Tampa and complimentary valet parking. Upon entering we heard the piano and found a few seats by the door. The place was pretty busy, but the entertainment had yet to really start. We ordered some drinks and we noticed that the waitress was swamped, her ability to keep up with our table and many others was quite impressive. I think the restaurant should probably look into getting her some help during these busy nights, she seems to be managing…but a little too slow and you could get one of those angry writers. After taking a look at the menu my parents ordered a Veggie Pizza and some wings. My Step-Dad was pleased with his wings and we discovered that one of my family’s favorite bartenders was also working in this place. The pizza arrived and looked quite unique. I had a slice so I could add it to my pizza tour. The sauce was made from marinara and not from your regular pizza sauce, it gave it a fresh and powerful taste. 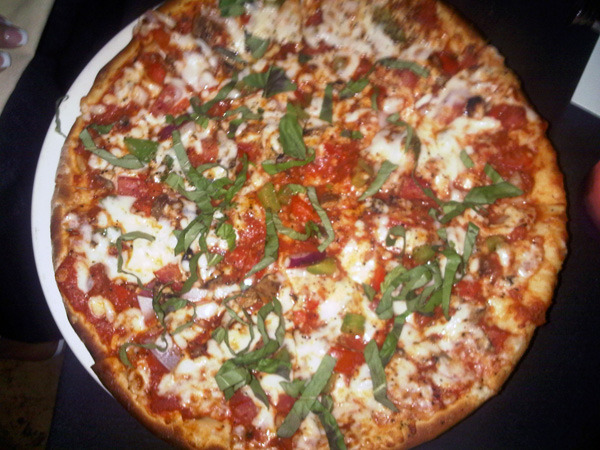 The toppings were all on thin crust and it almost tasted like something you could whip up in the oven, but much better. All the toppings were pretty good and the pizza actually had a slight kick of spice to it as well, which my family loved, and although I am not much of fan of spicy food fan, I still liked it. After the pizza I decided to give some of their dessert a shot. 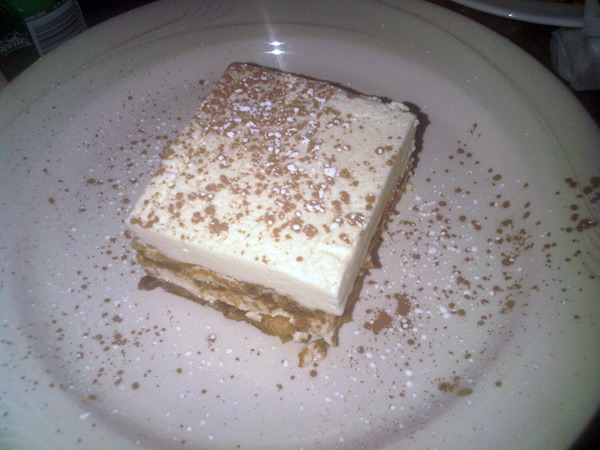 I ordered a Tiramisu ($8.95). It was decent, although a little too much liquor for my liking. It stayed true to the taste, but I think I prefer the Olive Garden when it comes to this dessert. If I was just going to review this place based on food and service, I would probably say that it is a mediocre experience and that it has a nice view (like many others have said). However, once the main Jazz singer for the night Cleo Heart (visit her website) hit the stage it was clear that all these critics had missed something. Vibrant and full of energy, she brought the crowd to the place and really brought that restaurant to life along with her on key pianist. She brought the experience from okay, to I’ll be back for sure. Extremely friendly to any stranger in the crowd, she was witty and her songs all had pizzazz. To be able to kick back to her singing while having a meal or some drinks, now that is worth coming here. She performs Thursdays, Fridays, and Saturday nights so I would recommend visiting during these times. A restaurant that advertises itself as a “romantic Italian restaurant” has made the right move to have her sing there. The view of downtown waterfront, some interesting food, a bar, and live music combined makes this place a pretty cool spot to be at in Tampa. Do you by chance have a picture of the scenic view you get fron that restaurant. Unfortunately I do not but on my next visit I will be sure to take one! Trust me though it was a great view.